Find Out When The Sales Are! Wondering when the next Debenhams Sale is? Our guide will allow you to snap up those clearance items where you can save up to 50%, or those Blue Cross clothing bargains with as much as 70% off. Our savings guide will not only inform you on specific dates, but allow you to bag the best buys at Debenhams in the easiest way possible. This sale calendar is really easy to follow, so you'll always be in know what's happening in everyone's favourite UK department store, Debenhams. There are always Debenhams Discount Codesabout, and these are usually for FREE Click & Collect, Standard Delivery or Next Day Delivery. To use a promotional code, simply enter it in the box when at "My Bag". £5 worth of points for Beauty Card Members with any foundation purchase* Plus £10 worth of points when you buy a Clinique Foundation! Debenhams sale tip: Sign up* to the newsletter with Debenhams to get insider news on upcoming discount events! TheDebenhams Blue Cross Sale has finished. These are huge clearances take place around once a month to every two months, and are rather like a flash sale with large discounts, rather than a long Sale. We predict the next Blue Cross Sale at Debenhams to be around the end of May! Debenhams have hundreds of Bedding* items in their sale, including linen from brands like Star by Julien Macdonald, Scion and RJR. John Rocha. Debenhams stock a vast range of dresses*, and they include casual to formal, and everything in between. You can always find discounted sale dresses, whether they be clearance stock, or sale specials. The bargains are crazy - take this Red Herring - Black Check Side Stripe Mini Dress*for example... was £29 now £8.70. The range of Fragrances* that Debenhams stock is second to none. If you need a new perfume then you can save up to 70% off by getting it from the high street department store.Beauty Club Members can also accrue points and get money off future beauty purchases. There are over 3500 bags to choose from on the Debenhams site. You can always find bags with discounts and when the sale is on you can save up to 70%. With brands like Orla Kiely, Radley andKipling,reduced items sell fast, so make sure you buy them when you see them. It's FREE to join the Debenhams Beauty Club, and it's quick to do so online*. It works by giving you 3 points for every £1 you spend on beauty, fragrance, beauty services and beauty electricals. For every 500 points you collect, you get £5 to spend on beauty at Debenhams. That's not all, flash your Beauty Club Card at a fragrance counter in your local Debenhams for FREE Deluxe Samples too (whilst stocks last). When it's your birthday, as a Beauty Club Member you're entitled to a free brow wax by Benefit and a facial by Elizabeth Arden. All you need to do is show your Beauty Club card and proof of your date of birth within 2 weeks of your birthday. Use promo code SHA5 for FREE Delivery on all beauty purchases. 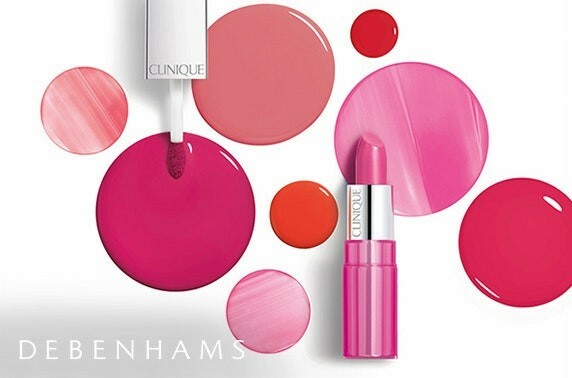 Debenhams Beauty Club often have special offers on in store where you can collect extra bonus points when you spend a set amount. These can be found in store frequently. When is the next Debenhams Blue Cross Sale? The last Blue Cross Sale we saw was March 2019! As per every Blue Cross Sale, it saw large discounts of up to 70% off. They take place around once a month, and don't tend to last longer than a week at a time. We predict the next Blue Cross Sale at Debenhams to be aroundthe end of March! What is the Debenhams Clearance? A good old Debenhams Clearance is when the High Street Department Store reduces stock throughout the ranges. It usually includes Beauty, Clothing (Women's, Men's and Children's), Homeware and Luggage. The best discounts we have seen in previous events have been 85%, although the usual amount is anything from 20% through to 70% off. Do Debenhams Do Black Friday? Debenhams will be taking part in Black Friday 2018. On Friday, 23rd November 2018, you'll be able to grab MEGA deals on Clothing, Toys, Homeware and Beauty items. Last year's Black Friday Event at Debenhams saw discounts of up to 70% off, across all of the departments, so we reckon this year will be no different. Keep up to date with Debenhams Black Friday here! Do Debenhams have Sales in store? Debenhams do host in store Sales and Clearance Events. The best one to catch is their Blue Cross Sale, where you can get BIG discounts. Some Debenhams Stores have a whole section dedicated to "End of Sale/Clearance" rails of clothes. Sales are frequent, often monthly, so it won't be long until the next one. Also, you can always find spot deals on selected clothing and homeware lines. - some gorgeous Ted Baker dresses and boots for your princess? , just looked on the website. They've got something similar in a wee top and leggings set too!